Kennel Days take place during the first and third Saturdays every month, even during the winter! 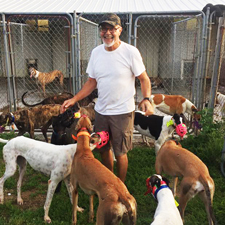 At Kennel Day, volunteers can stop by the kennel to walk, bathe and brush greyhounds, and even just give them lots of attention! Pre-scheduled adoption appointments between potential adopters and GPA-WI adoption reps also take place during Kennel Day. The kennel is located in Burlington.